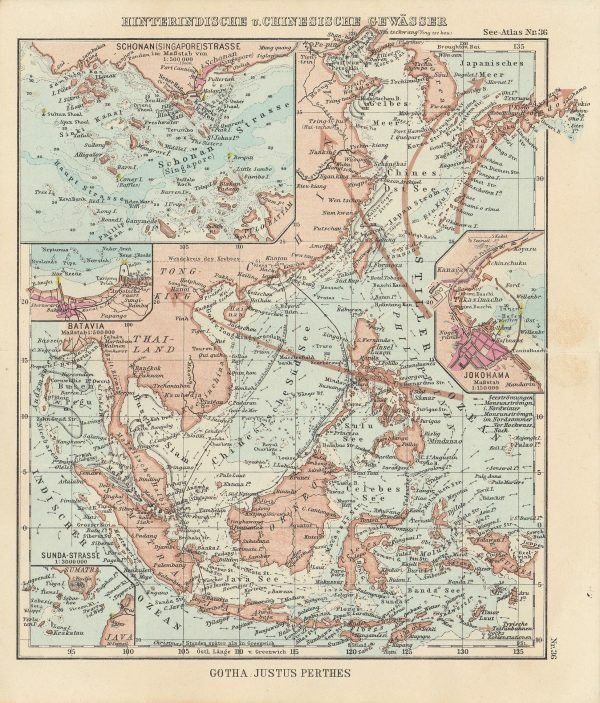 Antique map South-East Asia and China titled ‘HINTERINDISCHE u. CHINESISCHE GEWÃSSER’. A mid-20th century original colour German map of seas of Southeast Asia and China with an inset of the Singapore Strait from Justus Perthes See-Atlas. Published by Justus Perthes publishing house in Gotha, Germany. First published in 1894 (22 pages) with further editions to the mid-20th century, page 36 possibly from the 1944 edition. Excellent condition with title on verso; measures 171 x 146 mm.